A customer has been mentioning that she would love a gameboard for her room. 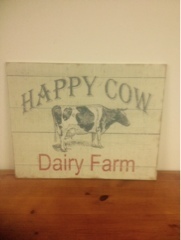 She gave me this cute cow print that happened to be wood. Although the cow picture was cute, it just was working for her. So I got the idea to surprise her with a gameboard. I used my chalkboard in mustard as a base coat. 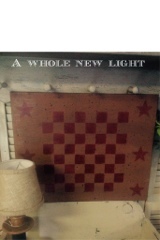 Stenciled the checker board in Burgundy with stars. I aged it with a black overlay to give a worn look . Hope she loves it.